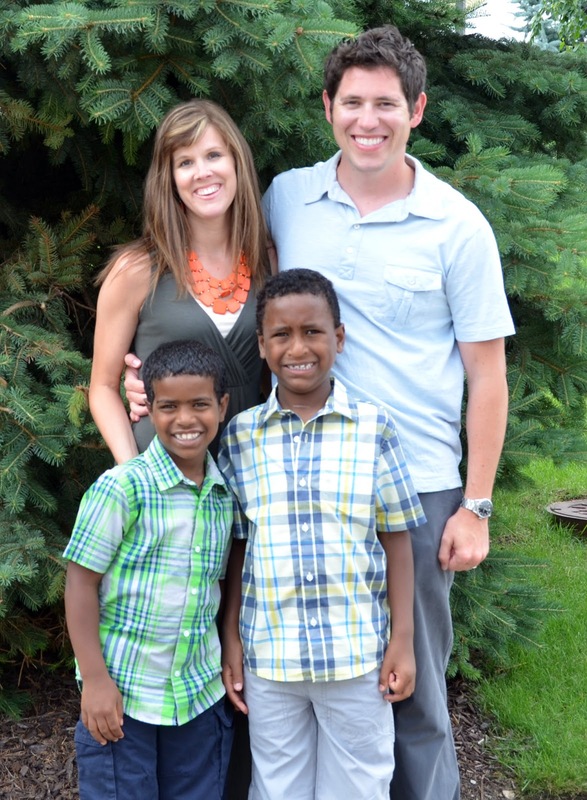 Today's guest blogger is Kim, pictured here with her husband and sons on their first day as a family. One minute you're two happily married people who do whatever you want, whenever you want. Maybe you want to go to see Mumford and Sons. Done. Maybe you want to drive up to Minneapolis for some sushi and shopping. Done. Then suddenly you're bent over the toilet at the Ethiopian guesthouse losing your breakfast because you found out that you're becoming real-life parents three days earlier than planned. "I can't do this," you beg. "Please God. I don't know what we were thinking. I've changed my mind. Please." One minute you think you've adopted two healthy boys with big appetites and energy to play soccer for hours. Then suddenly your husband is spending four hours in a clinic in Addis Abeba with your oldest son who had a seizure your last night in country. Your son gets a shaved head, has an EEG that shows some kind of abnormality, and in a rush you pack at the guesthouse in order to make your flight back home. One minute you think you have faith. You believe in Jesus. You trust in His plan for your life. Then suddenly you're clinging on with white knuckles, begging that He doesn't leave you, crying out for the strength to get through each day. Maybe you're finally figuring out what faith really is. So, in a nutshell, that describes our first months of parenting. Like the crazy folks we are, my husband and I went from being the parents of zero children to being the parents of two older sons adopted from Ethiopia. We really did everything we could to prepare. We read the books, watched the videos, had the conversations. But still there were many unexpected challenges that came as a side order with the main dish of older child adoption. For our first several months of parenting, our oldest son suffered from seizures, sometimes several a day. We had no prior knowledge of a seizure disorder. It wasn’t until the night before we were supposed to fly home from Ethiopia that he had his first tonic clonic seizure. It feels like a dream to remember this time. After we came home, sweet Getu had seizures sometimes several times a day until last September when we finally got his medications under control. Getu’s seizures didn’t make us love him any less; they made us love him move. I’m not sure I really understood what it meant to be a mother until I cradled my then 8-year-old son’s limp body on our kitchen floor after he had had another seizure. We survived traumatic blood draws, CT scans, MRIs, and multiple doctor’s visits. We became a family. Other challenging unknowns have manifested themselves in the narrative we’ve been told about our sons. This part is personal; it’s not my story to tell. I will just say that some of the stories we’ve been told from our agency and from the boys and from another third party are conflicting. Not kind of conflicting. Mind-blown-not-sure-how-to-proceed conflicting. And we used a reputable agency. Stories like ours aren’t unique either. So health unknowns, behavior unknowns, and narrative unknowns should not come as a surprise. I would like to say that I wore my new role as an adoptive mother like a well-worn parka, comfortable and warm. The reality is that I did more crying and yelling in those first months than I really want to admit. (Except I just did.) And I wasn’t the only one in our family experiencing Big Feelings. Yes, the first several months were accompanied by a myriad of what my husband and I have deemed Big Feelings. Big Feelings manifest themselves in tantrums, inexplicable crying, difficulty getting to sleep, physical violence, and ugly talk. Bryan Post breaks down our emotions into two categories: fear and love. Those first months home will carry with them a lot of fear for your children and for you. We were somewhat prepared for this, but the extent of the Big Feelings was definitely an unexpected challenge for us. I would like to tell you that now, over a year later, we have all conquered our Big Feelings and are carrying on in our world of butterflies and unicorns and neuro-typical children. However, that would be a Big Fat Lie. The boys (and the parents!) do a much better job of recognizing and handling the Big Feelings, but there are still moments where it feels like we live in a town with BF as mayor. That is certainly a daily challenge that comes with older child adoption. This is something that I am internally wrestling with on a daily basis, and I just couldn’t have predicted what a giant deal this would be. We are a transracial family, so this is mostly a complication of that, not just older child adoption. I do think, though, that we’re dealing with these issues and conversations in much different ways than if we had adopted younger children. Yes, those younger children would still have memories and experiences from birth culture, but not in the same way that an 8- and 9-year-old child would. From day #1 we tried to incorporate Ethiopian culture in our house. I cooked the foods, played the music, showed the videos. And despite every effort, the boys now reject nearly everything but the food. They lost their first language, their birth words, the lexicon of their first family. And with that loss came more helpings of grief and confusion and hard, hard questions about belonging and identity and names. No matter how I spin it, my boys are being raised white with black skin, and when I think of their future, I can’t sleep. I’m reading books (like this and this) and being part of online forums and Facebook groups with adult adoptees who sometimes speak loudly in angry and unsettling voices because I need to know and prepare and seek to understand. So those are some of the unexpected challenges that come with older child adoption, and really maybe any adoption. This is by no means an exhaustive list; it’s just a few of our stories, our challenges. I have to leave you with this, though: Given all of these struggles would be still adopt our Getu and Endale again? Without a second thought! Check back tomorrow as Kim shares about the unexpected blessings of older child adoption. To read this whole series, start here with Day 1: 31 Days of Preparing to Parent. . . when you're adopting an older child. Kim is a full-time teacher, wife, mother, and Christ-follower. Her family doubled in size last April with the addition of Getu (9) and Endale (8). Kim blogs at Like the Love. I just love the fact that, despite the different skin color, I can't help but find that Getu has full cheeks just like Kim and Endale pretty much has his father's eyes and eyebrows!